No point having a category of racing in which people don't want to compete, is there? 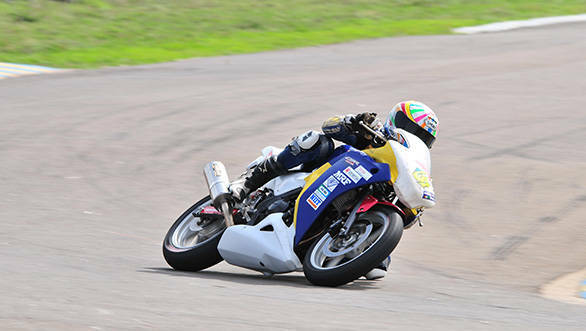 Over the 2012 season of racing, the 600cc class didn't seem to attract too many competitors. The race at the final round of the championship had to be cancelled because there was only one entry in the category. In addition is the fact that the 600cc class wasn't being backed by manufacturers, primarily because there aren't any 600cc motorcycles being sold in the country at the moment. In addition, there is no government support when it comes to importing 600cc motorcycles for racing purposes. All of which resulted in the category being axed. It is quite simple really. The riders who were competing in the 600cc category of racing until recently are now in other categories of racing, which means that the grid is now a lot more competitive. The Group C 165cc Open category now sees riders like Sarath Kumar, who has raced in Moto3, the Italian CIV National Championship and the Spanish Moto3 Championship, and R Deepak, who has competed in the Losail Road Racing Championship, adding excitement to the races. The level of racing has certainly gone up. The Honda CBR 250 One-Make Races are very impressive. This, because all the teams have to do is pay a figure of approximately Rs 70,000 for which they are provided with a fully prepared racing motorcycle. A rider who does well in the championship will be given a ride in the Honda Dream Asia Cup (where the company is already sponsoring Indian riders Sumit Lucas Toppo and Prabhu Arunagiri). A strong showing in the Dream Asia Cup could lead to a Honda-backed ride in other categories of international racing.